A sand dune, adjacent to our property, is often used for hikes and dog walking. 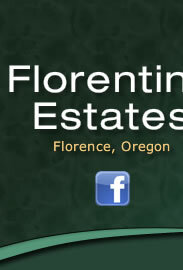 Two golf courses are within a mile of Florentine as well.. The lifestyle of our community allows you to be as active (or as relaxed) as you wish. We have a large clubhouse which includes the following amenities: meeting/activity rooms, indoor and outdoor pools, Jacuzzi, sauna, fitness/workout room, pool table, library and shower/locker rooms. We also have tennis courts and horseshoe pits. There are many organized activities including an RV club, tennis club, bridge club, water fitness, tai chi and book club among others. Other clubs being considered are for such interests as gardening, hiking, kayaking, and yoga....what would you like to do? Outside of Florentine, there is so much more to do. The central Oregon coast is an outdoor wonderland! The Pacific Ocean is less than 3 miles away with miles of pristine beach to enjoy. The Siuslaw River, 10 or more freshwater lakes, hiking (forest or ocean), kayaking, fishing, beaches, and the Sea Lion Caves are only a few miles from our neighborhood. Oh, and don’t forget “Old Town” Florence...a wonderful array of shops and restaurants alongside the harbor and the Siuslaw River. There are beautiful State and National parks nearby for camping and dune buggying. The weather is seasonal along the Oregon coast with more rain during the winter months. But the word “mild” best describes our weather! We rarely are hot and rarely are cold. Many outdoor activities can be enjoyed year round (some folks kayak nearly every day of the year). There are those occasional special days in the winter when a good book and a hot cup of coffee (remember, you’re in coffee country) is a great way to spend the day as a storm off the Pacific rolls through. The life style here can be whatever you wish. But given the variety of outdoor options, your wardrobe will likely include a few items that say “Nike” and your favorite pair of dress shoes may be “hiking boots”. There is an active Board of Directors (all volunteers and owners) as well as volunteer committees which work together to save the members time, effort, money, and energy and carry out a variety of tasks that ensures that our neighborhood continues to be the great place that it is. 2. Florence, Ore., a coastal community 180 miles southwest of Portland, is the best place to retire in the USA, according to the sixth edition of Retirement Places Rated (Wiley, published 2004). Florence: "For the outdoor enthusiast Florence is not a typical beach town. Residents' have a passion for the outdoors. There are 26 miles of hiking trails in the beautiful Cape Perpetua area alone and kayaking and fishing in both the ocean and many nearby freshwater lakes. Plus, there's a quaint downtown that feels like a historic fishing village." "Florence is the undersung gem of the Oregon coast. Old Town, where the Siuslaw surrenders to the sea, bears traces of its fishing and logging commerce, and is charming enough for me. I could while away afternoons in the Backstreet Gallery, a coop of about 20 local artists, or sip espresso in Siuslaw River Coffee, where I can admire the concrete pylons and Art Deco obelisks of the old drawbridge. There's a lot to discover near Florence too. We've visited the Heceta Head lighthouse, an impressive beacon, looked down on the Stellar Sea Lion Caves and hiked the Oregon Dunes National Recreation Area. At Darlingtonia State Natural Site, we hoped to catch the carnivorous cobra lilies luring flies to their gooey secretion and feasting on them. One misty morning, we strolled within feet of the pounding ocean's spray and spume. We picked up sand dollars and wondered how a huge beached tree stump had made its way from the forest to road's end." **AND, Florence has the lowest cost of living among the list of 15 hot spots. Come see us sometime...the coffee will be on - unless we are out in our kayaks, walking on the beach, hiking the forest, or having dinner in Old Town.